There's a great new sketch (WMSC34) this week at the Waltzingmouse Sketch Challenge. I'm still being inspired by the signs of spring in the garden and I love this color combo of lemon, light green and soft pink (my pink has a slight lavender hue to it! ), it's so fresh and cheerful! Ok, here's the sketch! This one's open to interpretation, you could make it as simple or complex as you like.... you know how I love my layers and texture though! I used Text-It from Waltzingmouse Stamps to stamp the background (the script font is my favorite!). The sentiment is from Half Pint Heroes also from Waltzingmouse Stamps, I switched the text a little, it did say 'happy' instead of 'smile'. The little flowers I made using the smallest flower from the Sizzix Tattered Florals die. The tiny bird I made from white Fimo and silicone mold from MoldMuse on Etsy. I decided not to paint this one, I thought it looked nice white. I haven't done any paper quilling in ages!! Shame on me, it's how I first got into card making!! I really like combining it with other techniques and elements now. Here I just used some simple scrolls and eye shapes to make up the leaves and vines. I cut out some simple leaf shapes and scored a line down the centre to add a little extra detail. I used the Swiss dots embossing folder to make the dotty paper at the base of the card. I also added a little lemon seam binding, some picot ribbon and a pearl bead pin that I made. Don't forget to check out what the rest of the Mischief Makers and some of the WMS made this week at the Waltzingmouse Sketch Challenge. Oh and don't miss the Friends of Waltzingmouse Stamps Blog Waltz on the 17th of February, the theme is 'Buttons'!! Other: White acrylic paint, pistachio quilling paper, quilling tool, swiss dots embossing folder, die-cutting machine, sewing machine, Tattered florals die, doily, lemon seam binding, lemon picot ribbon, sticky fixers, pearl pin. 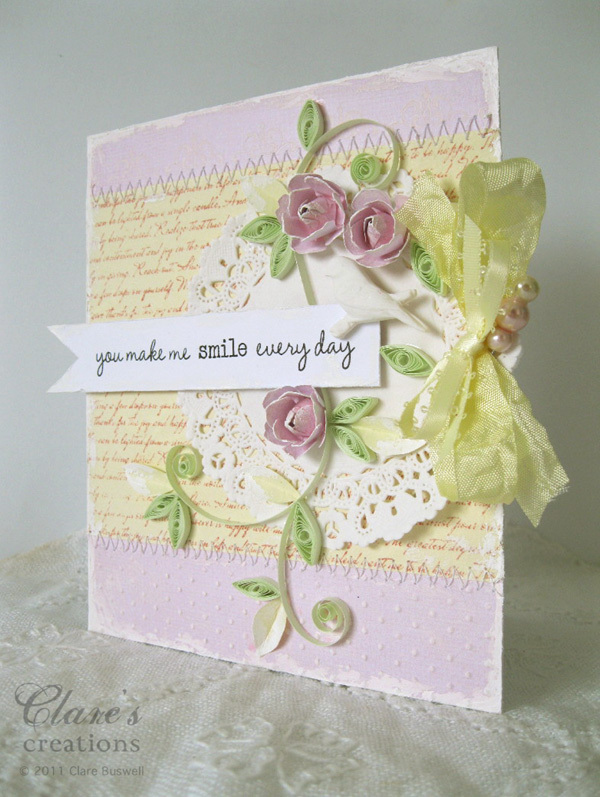 Just beautiful, you make quilling look so easy! 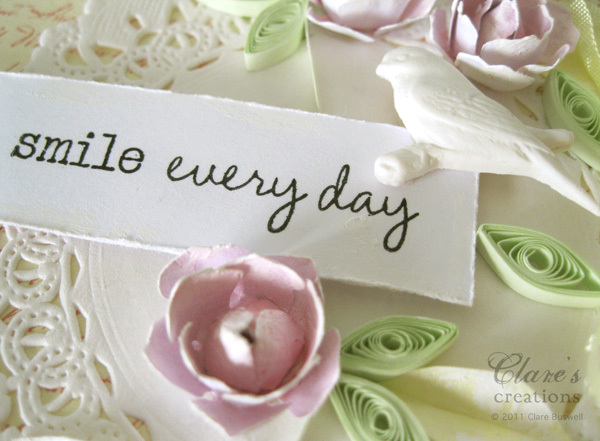 Love the little roses and the wonderful clay bird, fabulous details. Oh so sweet Clare! I just love the softness of this card - such delicate, pretty flowers and the quilling is perfect here! Very pretty! 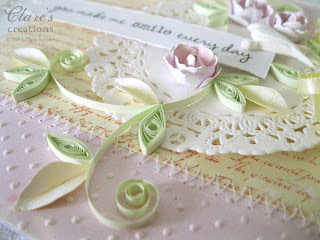 Gentle colors, so sweet and great quilling! I love everything on this card Clare! the colors, doily, beautiful quilling and sweet bird! 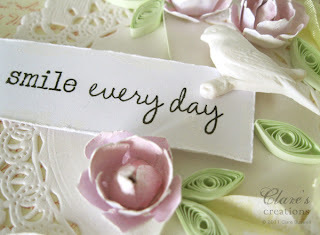 I just ordered a cameo and flower mold from them after seeing them on your postings! beautiful card....I love the colour palet. Gorgeous card, Clare! Love the little bird and trinket pin. altered items and on cards?? Thanks Cheryl, I bought the bird mold from MoldMuse on Etsy. Oh I adore this, Clare! The quilling is amazing and I've always wanted to learn! Love your take on the sketch and the springy colors! Beautiful! 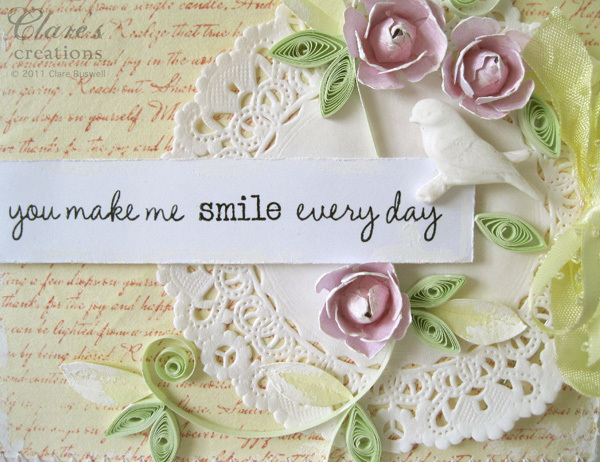 Love the quilling. Your cards are so pretty with this added to them. I do not have the patience to roll the paper, but maybe one day I'll just sit and practice. Love this card Clare! 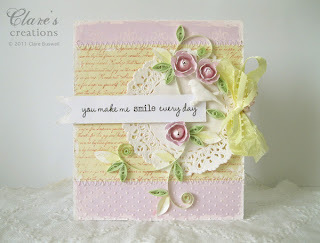 The quilling is such a pretty touch! I've never done this, but you made me want to try it out. All the colors look so pretty together too. I've been admiring your card for like 10minutes...no joke.